We got lucky when we got to Italy. The family we were staying with lives about 5 minutes down the road from Monterubbiano which is a tiny town in the hills above the Aso valley in Marche Italy. “La Marche” is known for being the shoe capital of Italy and for having rich soil for crops. Another thing it should be known for is amazing views of the mountains, the valley and the ocean. Looking east I could see the Adriatic sea, south east I see the valley and to the south I see snow capped mountains also referred to as a little slice of heaven. Below are a few pictures but trust me when I say that these pictures only give you an idea of how beautiful it is. Another way we got lucky was that we arrived in Italy at the beginning of festival season which is pretty much the entire summer. 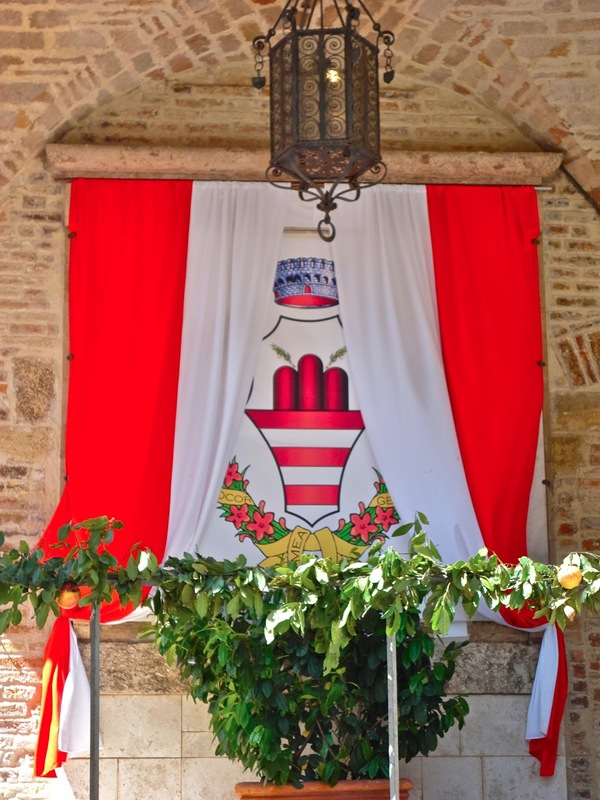 The first festival we were lucky enough to attend was in the town of Monterubbiano and the festival was called “Armata Di Pentecoste” or roughly translated to army of pentecost. The town has no records of the age of this festival but most of the townsfolks we spoke with say that it could be as old as Italy itself. The festival lasts for 3 days with activities like the band march, which is a group of about 15 drummers going up and down the streets banging out different songs. There is also the “meet and greet” which is where the “teams” for the Picena race or the “ring tournament.” There is also a holy mass that the town holds outside near the racecourse. We weren’t able to attend all the events but below are a few pictures of the ring tournament, the flag demonstration and holy mass. This festival is one of many that few non-Italians get to see because this region isn’t on the “tourist’s” radar. We believe, after staying here for nearly two months that this should be right up there with Rome, Florence and Venice. The views are unbelievable, the food is incredible and the beaches are perfect for families. There is just as much history in Fermo, Moresco and too many more to name. So if you don’t like all the crowds and hordes of photo snapping tourists then try the Aso Valley, you won’t be disappointed. The last few pictures I’m adding are just some of the many cool things we saw and did. So if you find yourself planning a visit to Italy take head in the best piece of advice I can give you about this lovely country, beware of the tourist. They come in droves, they take a picture of everything and they move much like cattle, slow bunched up and groan about everything. Enjoy! Fantastic goods from you, man. I’ve take note your stuff prior to and you are simply extremely excellent. I really like what you’ve bought right here, certainly like what you’re saying and the way in which in which you assert it. You are making it enjoyable and you continue to take care of to keep it wise. I cant wait to learn much more from you. That is actually a wonderful web site. I simply want to mention I am just all new to blogging and honestly enjoyed your web-site. Very likely I’m want to bookmark your blog post . You really have terrific well written articles. With thanks for sharing with us your blog. If you desire to improve your knowledge only keep visiting this website and be updated with the newest news posted here. friends concerning this article, while I am also keen of getting experience. article. I desire to read even more things abouit it! I will be returning to Italy and when I do, I will do a better job of enjoying my time there. Thanks for the comment.